While eating spaghetti on Monday night, Monty’s crown fell off (his tooth)! Luckily, he didn’t swallow it. 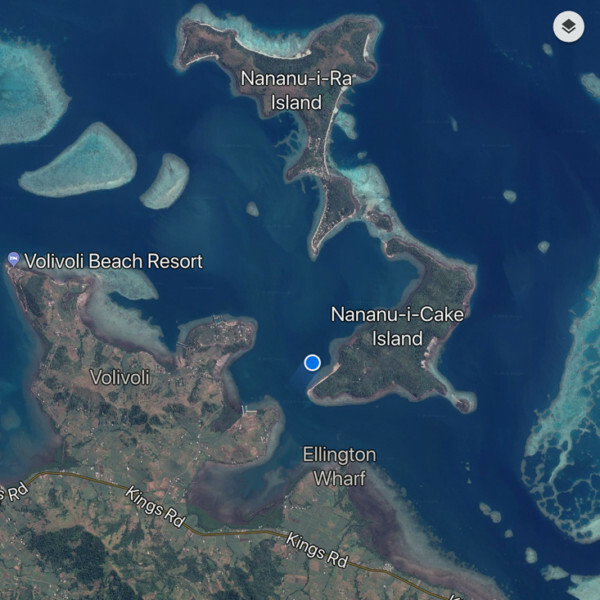 We were on our boat near the kiting spot off Nananu-I-Cake, 150 miles by car or a two-day sail from any major Fijian centre. The blue dot is where we were anchored. We immediately sent messages to friends who had had dental work done in Fiji. 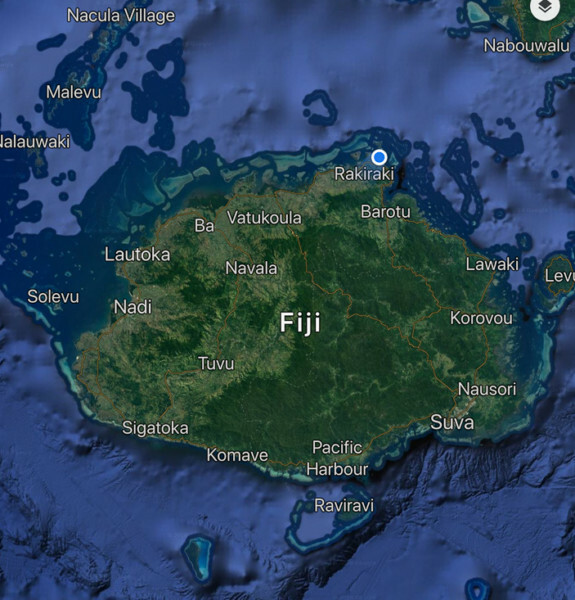 Our friends on S/V Fusio had just been to a good dentist in Lautoka. Monty called the office the next morning and was informed that the dentist takes measurements and gets the crown made in China. It requires a follow-up appointment in two to three weeks to install the crown. Cost $400 FJ ($260 Cdn). We also checked with Pam (S/V Roundabout II) and she referred us to a dentist she and several cruisers had used in Suva. Monty called and that dentist could make him a new ceramic crown and finish the job in an hour, cost $1,100 FJ. He had time available the next afternoon. Monty contacted our Vancouver dental office to ask if he really needed to get it fixed right away, and they advised he should. Monty also asked a kiter here on vacation, who happened to be a dentist in Melbourne, for his input. The fellow said, “Monty, you must have some glue on board. Glue it on yourself!” The Suva dentist seemed like the best option! We looked at the weather, not really wanting to miss a day of kiting. The next day’s forecast didn’t look windy enough to kite, so he booked an appointment with the Suva dentist. We called to arrange a taxi, and were informed it was a 3-hour 150km drive to Suva with a cost was $280FJ return. Though unfamiliar to us, several yachts were anchored around us, so we felt more comfortable leaving Whistler for the day. Cruisers typically watch out for other cruisers. Monty asked Warren, my kiting instructor who owns a local resort and Ellington Wharf, what he felt about leaving the boat for the day. He asked Monty if he locked the boat. Monty replied, “yes”, to which he replied, with a grin, “too bad”! He assured Monty that the boat and our dinghy would be safe. On Wednesday morning, we locked Whistler up and motored our dinghy to Ellington Wharf, about a mile away. Our taxi driver, named Guru, met us at 8 am. The King’s Highway is a fairly direct route, with fields of green sugar cane and black volcanic mountains dominating the landscape for first 10 km. 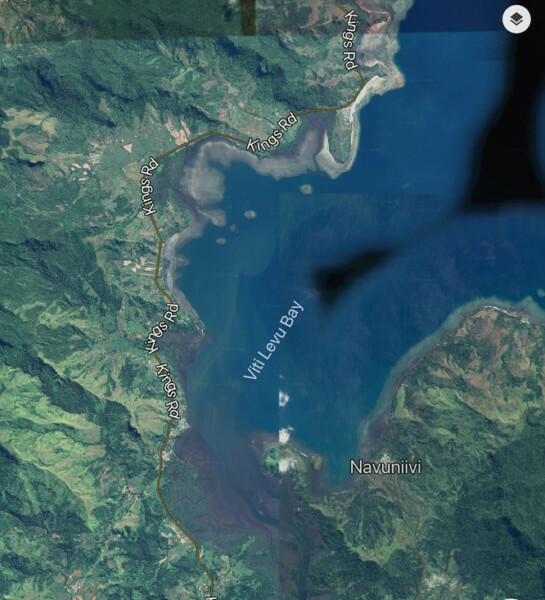 As we travelled south, the road offers views of the Viti Levu Bay surrounded by green hills with the occasional cone of black rock protruding toward the sky. The large attractive bay is sometimes used as an anchorage for the weary sailor. The highway then turns inland, winding through river valleys, as it bisects numerous small Fijian villages. Once proudly-painted, but now sadly faded, tin-clad houses with just a few rooms were built in clusters near the road. What ever colour paint was on sale at the store came to mind. Homes nearer the river, where flooding was a regular occurrence in the rainy season, sat on stilts. Houses spread up the hillsides of the larger villages. Exotic plants like croton, ginger and bird of paradise common in yards and along the roadside. Most villages had a school and all seemed to have a church, usually a modest Methodist establishment with tired pale yellow paint. The adoption of the Christian faith has a strong influence in the country and lead to the abandonment of cannibalism as a way of life not all that long ago. Those missionaries had a daunting task, but they did succeed! Between the villages, the hills were densely wooded with trees covered in large orange-red flowers, bamboo and vines. It was quite scenic at times but we didn’t really have time to stop to take a photo. Produce stands stacked with cucumbers and kassava dotted the roadside. The soil was red and thickly layered where it was uncovered. Most deforested areas were occupied with some crop-growing, dairy farming, sheep, goat or cattle ranching. A few lean ponies were being ridden along the highway or were tied to a stake. We passed briefly through what our driver called “cattle country”, though we didn’t see many cows and no cowboys! Rural Fiji appears poor but self-sufficient in their own modest way. All encountered either initiated or returned our wave or “Bula” greeting. Smiles are free and they don’t mind using them! Our driver had to maneuver around a few car/truck accident scenes and we were glad we were being driven, and not driving ourselves. Monty remarked that we never saw a motorcycle or bicycle all day! Our driver said people prefer a car, and given our experience, likely much safer! The traffic was not heavy until Nausori, a large suburb near Suva that is home to an international airport. The traffic was thick, hindered by construction as the road to Suva was being twinned. Numerous small strip malls lined the road, just like Kelowna! Our fridge was nearly empty, a rarity for Whistler, so the timing for the trip to a major centre was excellent. Monty’s appt was not until 3:30, so we had time to reprovision. The Municipal Market was the biggest we have seen. We bought lettuce, tomatoes, bokchoy, gai lan, Japanese eggplant, cucumbers, spring onions, hot peppers (by mistake) and hot chillies. All were at the peak of freshness. Some items like papaya, pineapples, passion fruit and bananas were going “out of season” with the cool winter weather (24 degrees celsius). With some hunting, we were able to buy some fruits that weren’t too small or distressed. 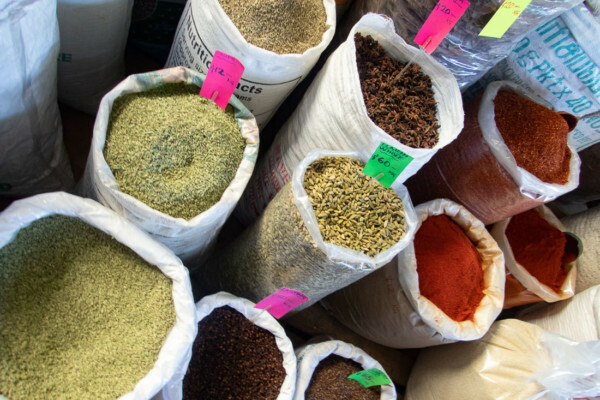 Carrots, celery, green and red peppers (called “capsicum”), apples and oranges all had to be imported, so more expensive, but in good condition. We stepped upstairs for potatoes and onions. An emporium of kava was the main attraction on the second level. The prices were shocking. 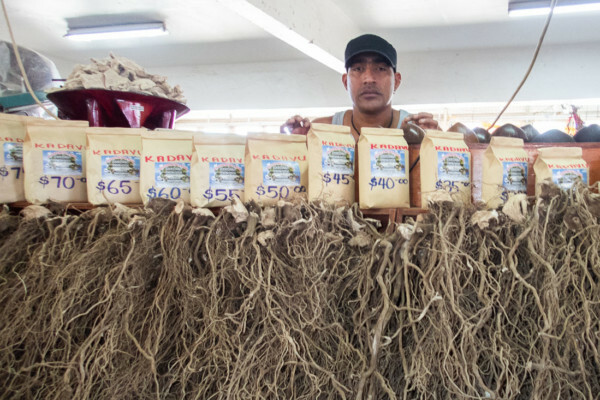 Kava root, that sold for $25 to $40/kilo a few years ago, was selling for $150/kilo. Who can afford this on a Fijian income? Is it the end of the kava-drinking way of life for Fijians? Next stop, Cost U Less. Another cruising yacht, Jadean, with had recently been in Suva. He recommended this store, which was situated across town. When it came to knowing his way around Suva, Guru, our driver, wasn’t exactly a “guru”. He called his brother-in-law, a local taxi driver, for directions. Monty assisted using the Maps App on his iPhone. It was a bit comical but we made it there. While in NZ, we had not stocked enough of some items that we commonly use. Since we eat on board 95% of the time, we do go through food! 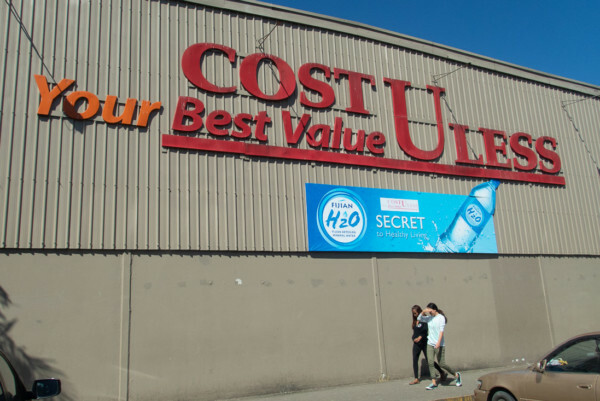 At Cost U Less, we were delighted to find some items that were either not available, outrageously priced or stale-dated in other Fijian stores. Granola/cereal, pasta, packaged yogurt, olives, capers (and a few bags of chips and nuts) were added to the trolley. More googling and calls later, we found Victoria Wines, just a few blocks away. It has best selection of wines in Fiji, with many wines priced lower than in Canada. New World, a NZ grocer, was in the same mall. There I found protein bars and my lactose-free milk, which was not stale-dated like it was in Savusavu! Now I won’t have to fuss taking Lactaid pills when drinking milk or Monty’s barista-style cappuccinos over the next couple months! Back across to the city centre, with Monty and Guru’s brother-in-law giving directions, we located the dentist’s office. We had just enough time for a quick lunch at a Chinese restaurant. Guru waited patiently and kept our produce cool in the back of the car, using the AC now and then. Monty went to Dr. Vikash J. Singh’s smartly appointed office and watched a video of elaborate dental procedures while he filled in the questionnaire. As Monty would, he joked with the staff about seeing V.J. Singh. The Adelaide-trained dentist quickly did an assessment and determined he could re-glue the old gold crown. He told Monty it was good he got in so quickly as his adjacent teeth had already started to move, making it a tight fit. Monty was out of his office in 15 minutes with a bill of $150FJ! With all our chores and appointments finished, we directed Guru to take us back. He drove south through the city centre, along Victoria Parade which merged into Queen Elizabeth Drive. Suva’s architecture has a strong Colonial influence and its history which begs to be explored. We were sorry we didn’t get to the Fiji Museum. We were concerned Guru was headed in the wrong direction, as we had to go north east eventually, but he carried on south. He was on the cellphone with his brother-in-law. Monty double-checked his Maps App while I looked at an adopted, but dated, Rough Guide and read about the history. We passed the beautiful colonial style Grand Pacific Hotel, completed in 1914, then Thurston Park and Government House, now the personal residence of the President of Fiji. Continuing on the Drive, we noticed a sidewalk following the shoreline which looked like a nice venue for a run or evening stroll. Guru continued reporting landmarks to his brother-in-law in Indian, pulling over on the side of the road from time to time to reconfirm. We motored by Parliament House, Suva Point and the National Stadium. The scenic drive around the point was very worthwhile from our perspective. There was little traffic, so it was likely much quicker than going through town, especially at 430pm. Thankfully, our driver terminated his call once we were back on busy King’s Highway. He drove a little faster on the way back, but not excessively. We all wanted to get home! We were back to Ellington Wharf by 7pm. It was pitch dark. Several people were hanging around the end of the road, near the wharf, likely socializing and drinking. It was a local hang out. A tall Fijian man approached us as we got out of the car, asking if it was OUR dinghy that had been left tied to the wharf all day. He gave us the impression he was looking after it, which was nice. The Fijian and our Indian driver helped us carry the numerous bags of food to the end of the wharf. We paid our driver and tipped them both, said our good byes and carefully loaded the goods into our dinghy. The wind had picked up so I was concerned all our produce and packages would get a salt water wash on the ride back but, fortunately, it wasn’t very rough. The channel’s chop seemed to be more like rollers. Monty couldn’t get the dinghy to plane, it was so heavily ladened. After 12 hours, Whistler was just as secure as we left her. It took a while to get the goods stowed so we decided that a packaged soup with some chopped green onion, carrot and celery would do for dinner! Lots of wholesome delicious meals were in our future but not tonight. It was a long but productive day! Thanks to our friends for their referrals, our West Broadway Dentist office, Dr. Singh and our driver, Guru. The next morning we had a visit from a couple on Enchantress, the yacht from Aberdeen anchored nearest us. David and Susan introduced themselves and asked where we had been all day. They had been concerned that we had not returned to the boat in daylight. We had them on board for coffee and made new friends. Cruisers are such great people! 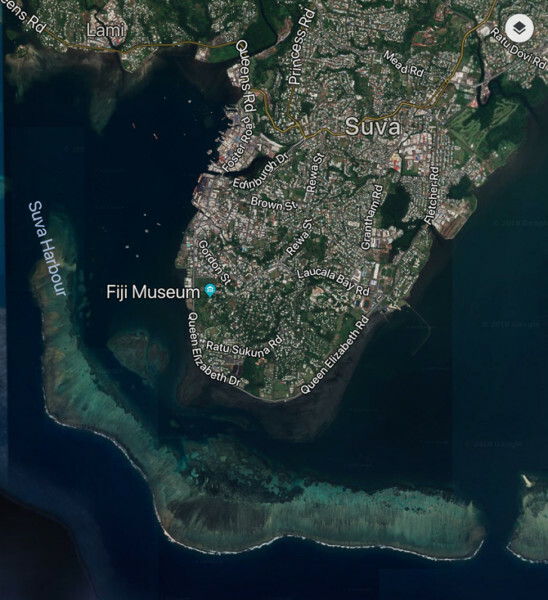 Though not high on the priority list, we would like to revisit Suva. The history is intriguing and there are many sites to explore. From a cruisers’ perspective, the provisioning options were excellent! Maybe we will ask Whistler to take us there sometime! Tooth problem led to a delightful exploratory excursion. What’s next? Thanks for sharing your tour. for Humanity. I’ll share your descriptions with him. Thank you!